My husband Geoff and I spent a wonderful week in cabin 1!! We stayed from Dec. 20-27. We brought our 14 month old daughter, Frankie and our yellow lab, Bernie! Being from Florida, this was a HUGE change from our everyday life! It was so quiet and very peaceful! The cabin was super cozy and JUST perfect! Jill had many suggestion books in the cabin with lots to do! We visited the Biltmore estate on Monday. That was very cool as it was decorated with hundreds of Xmas trees and lights. We also went exploring a few days just driving north and south along the parkway. We stopped along the way to check all the beautiful sites. A couple days of rainy and foggy weather did not hold us back from our adventures! On our last day, we visited Grandfather Mountain, the weather was so nice, it was a perfect day. After grandfather mountain, we headed to a trout farm in Boone where we caught fresh trout for dinner. All in all it was a great vacation with our family. 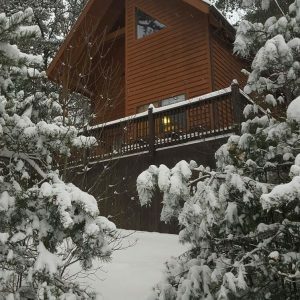 We highly recommend Jill’s cabin(s) to anyone looking to get away from their everyday life!